Life’s a walk in the park with Flowers video slots! So watch the flowers bloom, stroll past Sun Wilds, Stacked Wilds, Double Symbols, FREE Spins bonuses, multipliers and uncover rich treasures! 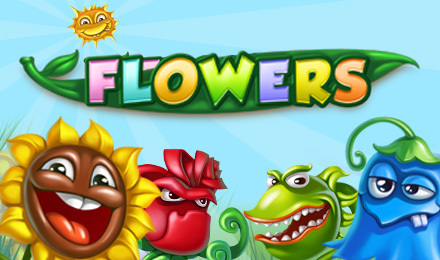 Wake up, smell the roses and watch the flowers bloom into budding riches with Flowers video Slots. Spin through 5 reels and 30 paylines of flower-blasting fun from Netent, with beautiful animated floral symbols. You can also spin through Sun Wild features, Stacked Wilds and Double Symbols. If the Cloud Free Spins symbols grace the reels, this will unlock the FREE Spins bonus round. In this exciting game the symbols can transform into more double symbols, and you can trigger extra FREE Spins and multiply your winnings. So get ready to take a stroll through Flowers slots for real money prizes at Vegas Spins!